Welcome to the website of Epic Robotics! My name is Scott/EpicentrE, and I am the captain and sole member of the team. I build combat robots in the Antweight class. These robots are similar in design and intent as ones from popular TV shows such as Robot Wars and Battlebots, however they are much smaller, weighing in at a maximum of 150g, and needing to be small enough to fit within a 100mm cube. I hope you enjoy your stay, and please feel free to contact me if you have any questions, feedback, comments or suggestions. 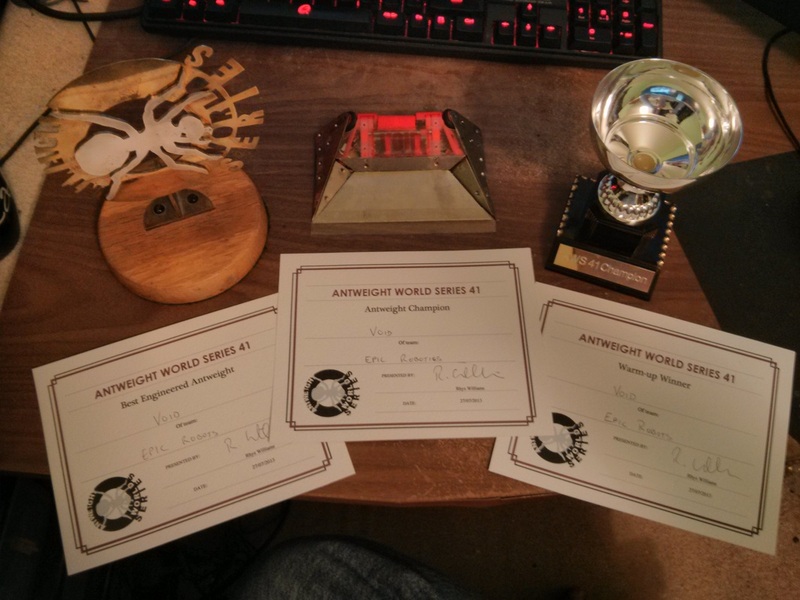 I managed to win another AWS, AWS42, in October of last year, bringing my total wins up to 3. I once again think I got very lucky, and intend to completely rebuild Void, as well as build a brand new robot, before my next event. I'd rather not rely on chance a third time. I attended Ant Freeze in Nuneaton in January where both of my robots performed terribly, only solidifying the fact that they need a rebuild. I did, however, stream the event live, which was quite easy to set up and a lot of fun, so it's something I may do more of in the future. I managed to win my second AWS with the new version of Void, Void 8. I was incredibly happy with how the design worked, despite having some serious weaknesses, I managed to overcome them and take home the trophy again. I've also just updated everything on the site, so it all should be up to date now. Please let me know if you notice any errors or omissions! After years of trying, I've finally managed to win out over 70 other robots to take the AWS trophy! And on my birthday as well! It felt amazing to finally take first place, after 9 years of competing, learning, improving and practicing. I want to give a massive "thank you" to the people who supported me, who cheered for me and said that I could do it. I'm also hosting the next AWS in Coventry in November, where I'm sure I'll be too busy to put up a very good title defense, but I'll try my best anyway! The new website is live! The links page still needs doing, and I want to go through all of my old robot descriptions and weed out the spelling and grammatical errors that past-me made, but apart from that I'm pretty happy with it!